San Diego’s Convoy Street runs through the central neighborhood of Kearny Mesa. Strip malls packed with restaurants whose signs—in Japanese, Korean, Chinese, and other Asian languages—bear the names of some of the best eateries in town. Popular favorites among locals include Shabu Shabu, Tofu House, and dim sum at Emerald restaurant. But excellent ramen, poke, bulgogi, dumplings, pastries, and desserts aren’t the only reasons to come to Convoy—there’s also karaoke, arcade games, and bliss-out sessions at Korean spas. No matter how delicious the Chinese and Taiwanese dishes at this restaurant—including things like braised roasted duck noodle soup, pork and chive dumplings, and foie gras pork boa—they’ll never be what the place is known for. Not as long as they continue serving their “Freakshakes,” anyway. 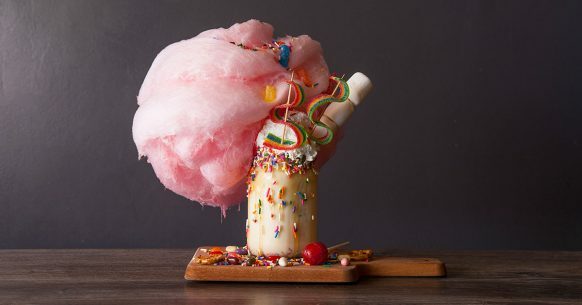 Milkshakes born to be shared and lavishly topped with donuts, sprinkles, peanut butter pretzels, and sea urchin cotton candy (take a moment to wrap your head around that one) have a way of stealing all the attention. Arrive early at this uber-popular, family-friendly restaurant serving nearly 250 traditional and inventive Vietnamese dishes. Copious fresh vegetables and herbs compliment meats at this eatery that started in one family’s kitchen and first grew into a restaurant in Linda Vista in 1988. San Diego’s Asian food scene is dominated by Vietnamese, Japanese, and Thai eateries, with Korean, and Cambodian eateries making notable appearances. Chinese-food lovers have a harder time finding their bliss, though Village North, a relative newcomer, makes that much easier with its hot pot, taro root desserts, and pigs’ feet. You get to be the chef at this Japanese barbecue joint. The grill-your-own style (which takes place at an in-table grill) is similar to the Korean barbecue probably more familiar to American diners, but marinades are more miso-heavy. Choose your albacore tuna, octopus, or salmon poke over rice, greens, or in a rice and seaweed wrap that resembles a tortilla (hence the name, a portmanteau of “poke” and “burrito”). Then customize your seafood and base with all manner of toppings familiar to poke lovers: furikake, masago, tempura flakes, and even Flamin’ Hot Cheetos. No single term could describe this 20,000-square-foot restaurant, bar, nightclub, and arcade equipped with 14 private karaoke rooms. Work up an appetite playing pool or air hockey, or burn off dinner by dancing the night away. The Korean-influenced menu sports everything from fried rice and nachos to pork belly burgers, oysters, and sous vide steak. The drink list is as expansive as the establishment itself, with a dizzying array of barrel-aged cocktails, tiki cocktails, 50 draft beers, and a lengthy litany of liquor. And let’s not forget the karaoke rooms, where six people can rock the mic for $40 per hour. Dessert is easily as much fun as dinner in Convoy. Save some room for Iceskimo’s Taiwanese shaved ice—a style somewhere between ice cream and Hawaiian shaved ice. The handmade ice blocks in flavors like Black Sesame and Matcha Green are shaved down and then topped with tantalizing extras like Nutella, lychee, Bananas Foster, and oolong milk tea. Ice cream macaron sandwiches, churros, Vietnamese iced coffee, stuffed cookies—all of them wildly inventive and eminently Instagram-able—are the name of the game at this Asian bakery with hints of French patisseries. Escape from the busy cityscape by popping into this jjimjilbang, or Korean spa, complete with a Himalayan salt sauna room, a red clay sauna room, an ice room, dry sauna, and steam sauna. Reservations aren’t necessary but recommended for massages or body scrubs. And you won’t even need to leave the premises for Korean food! Just pop into their restaurant, serving spicy kimchi pork stew, bibimbap, bulgogi, and more. Shabu shabu is a style of Japanese food in which the individual cooks their vegetable and selection of meat in a pot of boiling water. Although it seems simplistic in nature, the flavor lies in the succulent dipping sauces. Shabu Shabu literally translates to “swish-swish” because the meat is swished in the boiling water, which can be cooked from medium-rare to well-done. This popular eatery is inspired by the owner’s frequent travels to Asia learning about trends in design and dining. If you’re seeking authentic dim sum, you’ll be pleased to know it’s served all day long. Their menu is expansive and includes Chinese regional cuisine, healthy alternatives, and seasonal favorites. Experience the wonders of a bubbling hot-stone pot with so many options to choose from. Whether you’re seeking beef, chicken, shrimp, or tofu, your meal is steaming with flavor. Don’t miss out on a local favorite in San Diego. This entry was posted in Neighborhoods and tagged culinary, north inland by San Diego Magazine. Bookmark the permalink.